The usage of preterite and imperfect tenses in Spanish is replete with a bounty of confusion. The Spanish preterite vs. imperfect comparison is demonstrated in the Penlighten article below. Conjugations of verbs change with regular and irregular verbs. The Spanish verbs 'gustar' and 'hacer' are among the few that have a very significantly different usage. Spanish is one of the very few languages in the world having a complicated, yet interesting set of grammar rules. Did you know that there are 21 tenses in Spanish? Yes, you heard it right, it is 21. The tenses in this language vary according to the way the verb in question is conjugated. There are certain syntax rules regarding the endings of the conjugated verbs. Accordingly, every verb has its own conjugation. Speaking of the past tense, it has two forms in Spanish - preterite and imperfect, which are used differently depending on the situation. There has always been an excessive confusion among Spanish learners with regard to when to use preterite and imperfect. The paragraphs below attempt to clear your dilemma regarding the same. Tenses in Spanish are rigidly structured and vary heavily with the verbs and pronouns in question. Verbs are in the infinitive form, and are classified as 'ar', 'er', and 'ir' verbs. For example, buscar (to search), vivir (to live), etc. The conjugations take place by replacing these endings with alternative endings. For example, for the present tense, the tense chart says that the singular first person ending should be 'o', for 'ir' verbs. Therefore, if you want to say 'I live' in Spanish, you will first drop the ending 'ir', after which you will obtain 'viv'. You will then add 'o' to this. Thus, 'I live' in Spanish will be 'Yo vivo'. In the 'endings' charts given below, the forms for the 'ar' and 'er/ir' verbs are written according to the person and number. That is to say, the order is according to the general Spanish tense chart - beginning from Yo (I), Tú/Usted (You), Él/Ella (He/She), Nosotros (We), Vosotros (You), and Ellos (They). The endings have to be placed according to the personal pronoun in the sentence. Also, remember that conjugations change according to whether the verb is regular or irregular. And, irregular verbs follow a different kind of chart. Take the verbs, 'comer' and 'ser', which are also taken as examples below. 'Comer' is a regular verb, while 'ser' is an irregular verb. They both will follow the same endings (as depicted in the paragraphs below), but the root is structured differently. That is to say, for 'comer', remove the 'er' and you will get 'com'. The endings are then placed after this word. That is how all conjugations take place. But in case of 'ser', you will not use 's' as a base in all cases. Similarly, other irregular verbs also follow different rules. When you want any verb to be in its past perfect and participle form, just add 'ado'/'ido' and 'ando/iendo' according to the verb type. Spanish verbs, like 'tener' (to have), 'poner' (to put), etc., are classified as 'go' verbs (informal usage). This is because they are conjugated normally in other forms, but the first person singular is formed by adding 'go' to the root. For example, 'I have' will become 'Yo tengo'. It is generally used for completed actions, i.e., it is used when the action has a definite beginning and an end as well. It is also used to refer to events that occur at a specific time or are repeated at a specific time. Many phrases are used to indicate that the sentence has a preterite usage. Preterite and imperfect endings are different, and they are both outlined below. In the above sentence, the verb used is 'llamar' (to call). And the action in this sentence is done a specific number of times. Since the action is done by you, i.e., 'I' in first person, the ending used is 'é'. The 'lo' here is the object pronoun. In this sentence, the action of buying the shoes is complete, and has occurred at a specific, definite time. The action is done by a third person, therefore, the ending 'ó' used for third person, singular form, is used for the verb 'comprar' (to buy). Observe this sentence carefully. There are multiple verbs here. The preterite is also used to describe a chain of events that occur in sequence. The verb 'despertar' (to wake up) is actually reflexive. And, since we are using third person plural, we use the ending 'aron' for this verb. The time is also specific (in the morning). The completion of reports and leaving for office are also completed actions. Again, the action is done in third person plural. And, the verb 'ir' is used to indicate leaving for the office. That is why the conjugations 'completaron' and 'fueron' are used. It is called 'Imperfecto' in Spanish. It is generally used for incomplete actions, i.e., actions that have no definite beginning or end point. It is also used to refer to any general, vague instance in the past, and not something that has a specific time of occurrence. It is commonly used with habits and descriptions. Just like its counterpart, it has many phrases that help identify it in a sentence. The imperfect tense is used for describing people, places, or things. In the above example, the verb is 'tener' (to have). We are talking about Esther, who is a third person singular, hence the ending 'ía' has been used. The imperfect tense is used to describe habits. Eating, sleeping, bathing, etc., are some actions which are described using the imperfect tense. In the above case, the verb is actually not 'go' or 'fish'. It is 'used to', which has a special usage in Spanish. That is to say, any habitual trait is described using 'used to'. The verb is 'soler'. And since the action is done by first person plural, the ending is 'íamos'. And after one conjugation, if another verb is in line, it is never conjugated. As in the above example, only 'soler' is conjugated, not 'ir'. Any kind of feelings or mental behavior is also expressed using the imperfect. In this sentence, the stage is set for something that had occurred. But nothing is given with regard to when this happened. Also, since it is a description, imperfect is used. You cannot use the preterite for such cases, because the time is always specified. Check out the sentences given above. In the first one, the third person singular preterite form of 'bailar' (to dance) is used, because the time is clearly mentioned from beginning to end. In the second sentence, the beginning and end are not exactly mentioned, but the time is specified, which again makes it a contestant of preterite usage. In the third sentence, however, the imperfect form of 'hacer' (to do/make) is used, because no time or any other information is given. The sentence just specifies a general data from the past. In this sentence, both, the preterite as well as imperfect forms are used. This is because the 12'o clock is an indication of time in the past, for which the imperfect is used, but since the action of eating is done at a particular time, the preterite form of 'comer' is used. The above sentence is also an example where the imperfect is used to allow the preterite form. 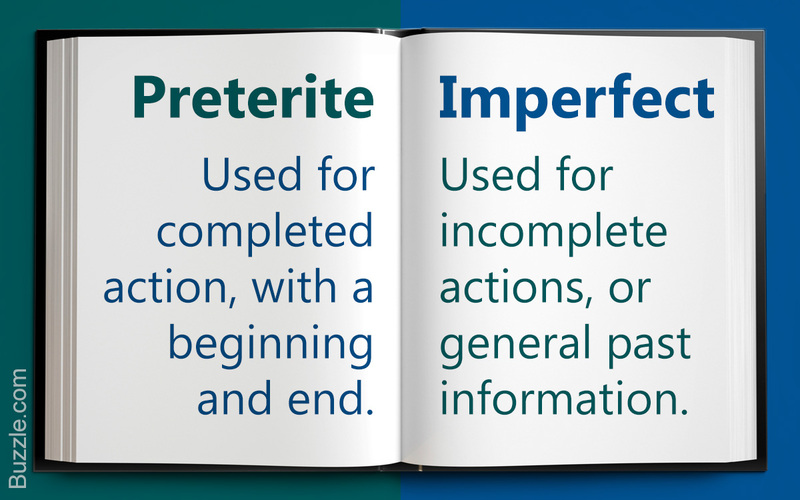 How about checking if you have understood the difference between preterite and imperfect? If you feel confident, take the simple quiz given below. Here, you will be given the verb and the subject. Judging the situation, you have to decide whether you need to use the imperfect form or the preterite form. Use the charts above, form the conjugation, and use it in the sentence. After writing down your answers, you can verify them as well. But do try to do it yourself first. Mind you, no cheating! Yo la conocí la semana pasado. Yo caminaba por el parque cada domingo. Que era Viernes, 12 de marzo , cuatro de la tarde. Ella habló hasta la medianoche. Yo escribí la carta ayer. Fue admitido en 7 veces el año pasado. Mi padre leía el periódico cada mañana. No había nada en la refrigeradora. Spanish grammar is so vast, it can send you into a labyrinth. But I assure you, there is no Minotaur lying in wait. All you will find is a treasure trove of knowledge. The above article was just a trailer; to be fluent in the language, you need to master the basics. There is no limit to learning, is there? So, just go ahead and learn more and more! And, if you have found the above article interesting, you might find Spanish pronouns and adjectives worth exploring as well.